Beaches, whether sandy or rocky, along with the bush behind them and the nearby sea, harbour an astounding variety of creatures. Photos in this section on the features and creatures of beaches were taken on or near the shore at different locations in south eastern Australia. The image above shows part of a flock of Crested Terns at Wilsons Promontory, Victoria (24 April 2014). This section will show physical features of beaches. I have many photos to add. This section will include photos of creatures arranged according to taxonomic groupings. 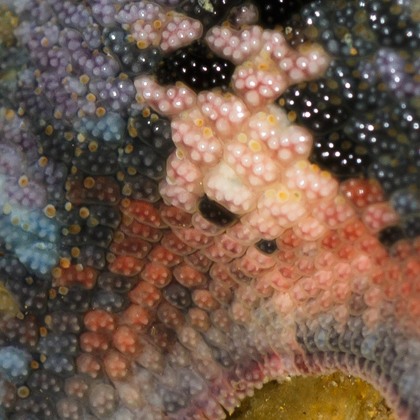 Echinoderrms are named for their 'prickly skin' due to the presence of hard calcareous spines and plates, though the degree of prickliness varies considerably both within and among the five main groups. Sea stars, commonly known as starfish, can be found in rock pools along the shore and also on sand in shallow water. Meridiastra calcar, eight-armed sea star. 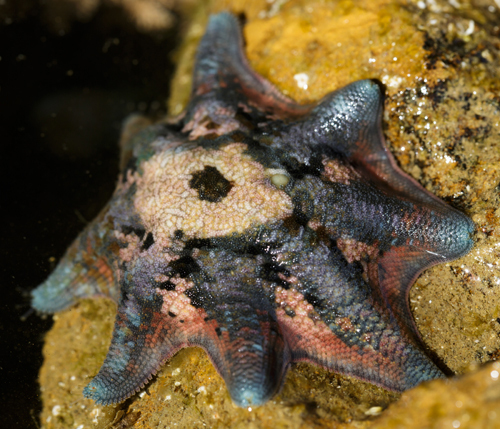 This colourful sea star was found at Ricketts Point, Victoria on 31 August 2014. The image below left is an enlargement of part the photo on the left. 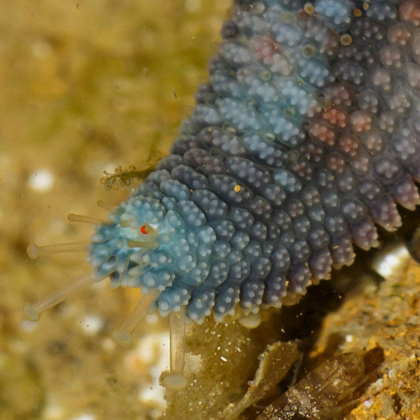 It shows more clearly the red eyespot on the end of one of the arms. The image below right depicts detail of the body surface between two of the arms.